“North Pole, NY” tells the story of Santa’s Workshop in upstate New York. Back in the day, Christmas may have been as tacky and commercialized as it is now, but it had heart. As can be seen in in Ali Cotterill’s documentary “North Pole, NY,” the holiday once conjured up a kind of magic and childish wonder. The film tells the story of Santa’s Workshop, a theme park established in 1949 by the wistful entrepreneur Julian Reiss. 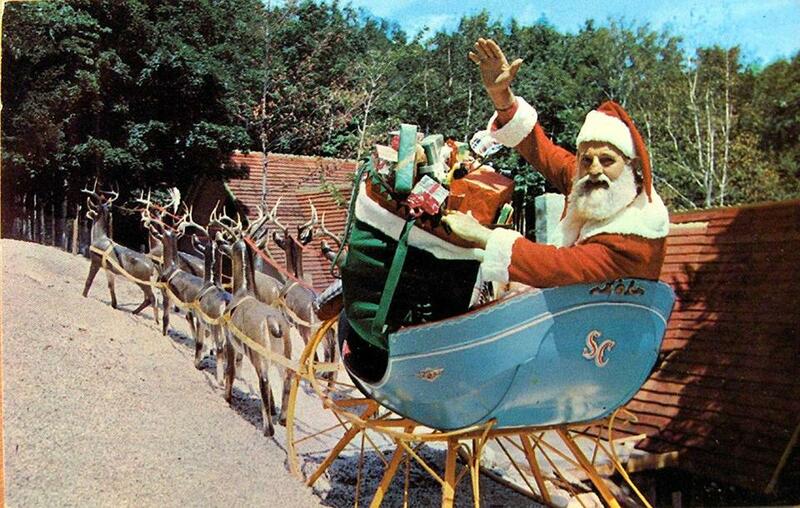 A Disneyland-like version of “Santa’s summer home,” as Reiss described it, set in the tiny town of Wilmington in New York’s Adirondack Mountains, it featured elves, reindeer (both the real thing and actors in costume), gift shops, a talking Christmas tree, and Santa — all proudly kitschy and irony-free. By the 1950s thousands visited annually to enjoy the corny skits and musical numbers and to introduce their kids to Kris Kringle. Santa’s Workshop grew to become the area’s biggest employer. Wilmington flourished, spawning motels and restaurants and other related businesses. A Christmas story would not be complete without a Scrooge or Grinch, and for Santa’s Workshop that role was played by Greg Cunningham, a crooked entrepreneur who in 1999 tried to buy up the then-struggling theme park and strip it of its assets. The town rallied to bail out the place and find a legitimate new owner. Though not nearly as thriving as in its heyday, it looks much the same, a relic of a more innocent time and a place where even cynical adults can still believe. “North Pole, NY” is available on DVD and across most digital platforms, including iTunes, Vimeo on Demand, and VHX. Ever go to a shelter and wish you could take all the dogs there back home with you? Ron Danta and his partner, Danny Robertshaw, do this. In Ron Davis’s heartwarming and thought-provoking documentary “Life in the Doghouse,” they have turned their sprawling South Carolina home into a big cozy kennel, where they shelter scores of strays and rescues. There they give them the love and care they need until they can find a home that will treat them as well. Over the past 10 years the two men have found homes for and saved the lives of over 10,000 dogs and have enriched the lives of those who adopted them. Now they are a nonprofit relying on donations to cover their $1 million annual budget. But the mission still has taken over their lives, their time, and their living space (they have up to 75 dogs occupying every part of their home, including their bed). Davis shows the labor involved in feeding, caring for, and cleaning up after scores of dogs. Not to mention the emotional toll of not being able to rescue every one of the millions of shelter dogs that are euthanized every year. But the rewards are great. Like finding a home for Lewis, a puppy with tiny legs who looks, as Danta points out, like a loaf of bread. Or even seeing that one of their permanent residents, stricken with cancer, is peacefully put to sleep and his ashes scattered in their garden. In addition to being a moving portrait of a couple dedicated to making a difference, “Life in the Doghouse” also makes an impassioned plea for neutering and spaying — and against puppy mills. Robertshaw got his first rescue dog as a kid when his mother talked him out of getting a Dalmatian and instead adopting a mutt from a shelter. “You don’t buy a pet, you save one,” she told him. As it turned out, he and Danta have saved thousands. “Life in a Doghouse” is available on iTunes, Prime Video, Google Play, and Xbox. As in “Life in the Doghouse,” a house takes on an unusual role in siblings Elan Bogarin and Jonathan Bogarin’s “306 Hollywood.” When their mother dies and leaves behind the family home at the title address, in Hillside, N.J., the brother and sister must confront the task of sorting through seven decades of belongings — old photos, used toothbrushes, dresses their mother designed — that were left behind, all connected with some memory. To do so they invent a new genre, the “magic realist documentary,” which is part archeological excavation, part whimsical collage, and part meditation on memory and loss. “306 Hollywood” screens as part of Emerson College’s Bright Lights Film Series on Dec. 4 at 7 p.m. at the Paramount Center. The directors will participate in a Q&A.